Mini-pies baked inside an apple are adorable and perfect for a sweet dessert without some kind of incredibly laborious nut-flour crust. Considering that nut flour desserts aren’t really the healthiest thing you could be eating anyway, using the apple itself as the “crust” for the pie is a perfect solution for a treat that doesn’t take all night to make and still scratches that itch for something apple-flavored and sweet. The only thing you’ll really have to watch out for here is making sure you don’t break the skin while hollowing out the apples: other than that, it’s pretty much a fuss-free process from start to finish. The walnuts give everything a hearty crunch, and the spice is simple but classic: vanilla and cinnamon to bring out the sweetness of the fruit. You can make this recipe with any kind of apples. Granny Smiths have a nice tartness to them, but feel free to pick your favorites – or ask for recommendations if you get to meet the farmer. And depending on how strong you like your flavorings (and how big your apples are), don’t be afraid to add more cinnamon and vanilla to the “pies.” These make a very impressive dessert presentation: make them for a party or just to enjoy for your own sake as a well-deserved and healthy end to a good meal. Cut off the top of 4 of the apples and set aside. Do not throw the tops away! Remove the inside of each apple with a spoon very carefully, making sure not to break the peel. Remove the skin from the remaining 2 apples and slice very thinly. In a bowl, combine the sliced apples with the walnuts, cinnamon, vanilla, and honey, if using. 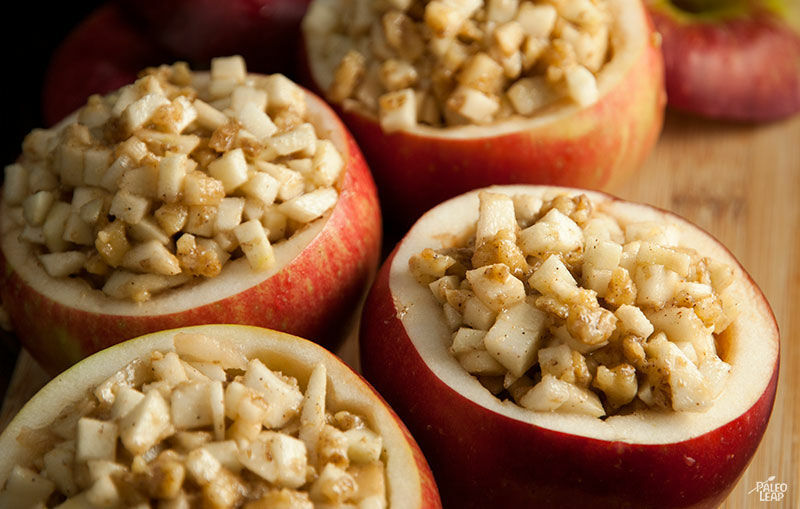 Scoop the apple mixture into each hollow apple, and cover with the top of each apple. 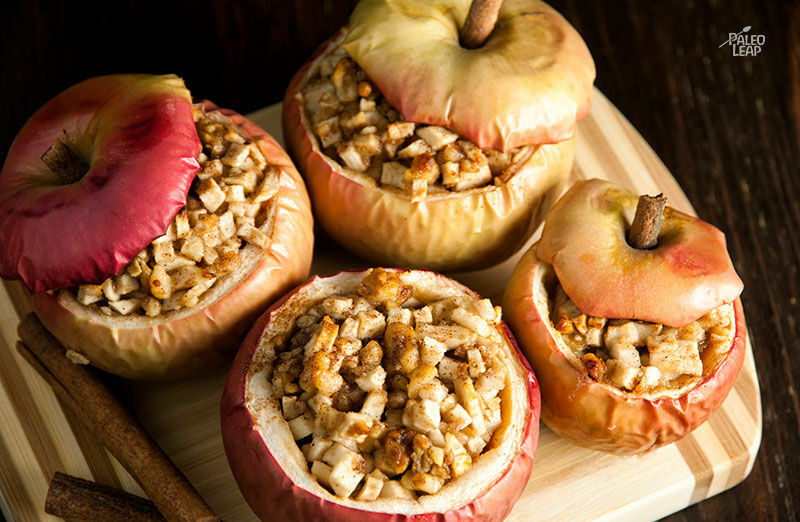 Place the stuffed apples in a small roasting pan and add water to cover the bottom of the pan. Remove the foil and bake for an additional 15 to 20 minutes.